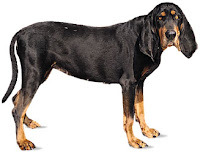 The Black and Tan Coonhound is a mixture of Bloodhound and the Black and Tan Virginia. It is thought to be an American breed which emerged during the 1700s. It has strong smelling sense and thus is able to easily hunt raccoon, deer, bear, cougar, wild boar, and opossum etc. General image of people regarding this breed is one of strength, deftness, and alertness. Each hound has its own distinguishable voice which may be recognized by the owners from a considerable length. They are of two types: Show and Field.